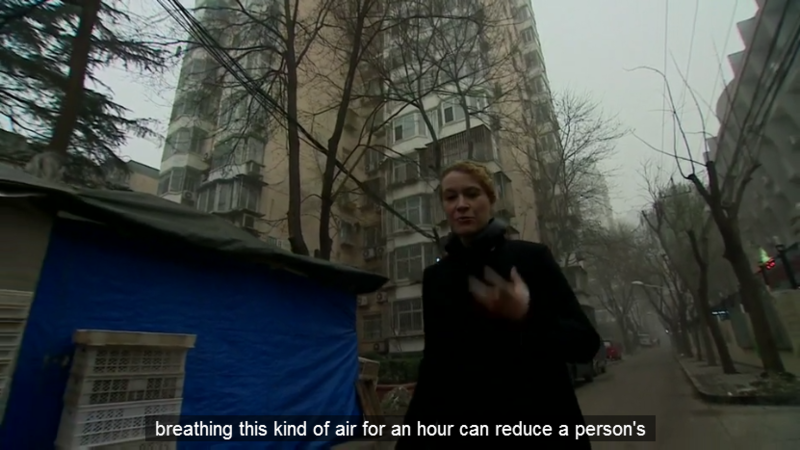 Does breathing Beijing's air for one hour reduce life expectancy by 20 minutes? A recent study showed that even breathing this kind of air for an hour can reduce a person's life expectancy by 20 minutes. This seems almost absurd. Is it based on evidence? When I was last in Beijing, pollution was at the hazardous level; every hour of exposure reduced my life expectancy by 20 minutes. It’s as if every man, women, and child smoked 1.5 cigarettes each hour. It should be noted that the quote notes that pollution was at a hazardous level which implies a degree of pollution above what the normal level may be for the air quality index (AQI). Note that an AQI of "hazardous" in the United States triggers warnings about emergency condition and is considered to have adverse effects on the entire population. These are generally considered to be exceptional conditions though. This paper's findings suggest that an arbitrary Chinese policy that greatly increases total suspended particulates (TSPs) air pollution is causing the 500 million residents of Northern China to lose more than 2.5 billion life years of life expectancy. The quasi-experimental empirical approach is based on China’s Huai River policy, which provided free winter heating via the provision of coal for boilers in cities north of the Huai River but denied heat to the south. Using a regression discontinuity design based on distance from the Huai River, we find that ambient concentrations of TSPs are about 184 μg/m3 [95% confidence interval (CI): 61, 307] or 55% higher in the north. Further, the results indicate that life expectancies are about 5.5 y (95% CI: 0.8, 10.2) lower in the north owing to an increased incidence of cardiorespiratory mortality. More generally, the analysis suggests that long-term exposure to an additional 100 μg/m3 of TSPs is associated with a reduction in life expectancy at birth of about 3.0 y (95% CI: 0.4, 5.6). Chen et al., "Evidence on the impact of sustained exposure to air pollution on life expectancy from China’s Huai River policy"
With regard to the health effects of air pollution there remains much to be learned. A large literature provides evidence that breathing combustion-related fine PM, even at exposure levels common to populations throughout the world, contributes to cardiorespiratory disease mortality and diminished LE. There is also encouraging evidence that improving air quality contributes to improvements in human health and LE (5, 11, 12). The results reported by Chen et al. (1) in PNAS make an important contribution to this evidence base that is growing hard to ignore, and begs to be better understood. Pope and Dockery, "Air pollution and life expectancy in China and beyond"
A decrease of 10 µg/m3 in the concentration of PM2.5 was associated with an increase in mean life expectancy of 0.35 years SD= 0.16 years, p = 0.033). This association was stronger in more urban and densely populated counties. Correia et al., "The Effect of Air Pollution Control on Life Expectancy in the United States: An Analysis of 545 US counties for the period 2000 to 2007"
So it goes without saying that the "unspoken" claim that there is a connection between AQI and life expectancy is true. The difficult part is determining if the exact value given has a basis in reality. Based upon review of studies that incorporated life tables (i.e. "A methodology to estimate changes in statistical life expectancy due to the control of particulate matter air pollution", "Air Pollution and Mortality: Quantification and Valuation of Years of Life Lost") I couldn't find anything to support the claim for a broad population. As such, the claim must be considered false due to being too broad. This still leaves the claim as it applies to Dr. Muller, which must be considered indeterminate due to lack of information such as age, underlying health conditions, and actual AQI which would allow the claim to be true for Dr. Muller specifically. Not the answer you're looking for? Browse other questions tagged medical-science environmental-health china pollution . Can brushing your teeth too often damage your teeth? Are fume events a frequent health hazard to airplane passengers? Do Gunnar Glasses reduce eye strain? Are laundry detergent and fabric softener fumes dangerous to human health? Is the eye-movement aspect of EMDR therapy more effective than other available therapies for treating trauma survivors? Is “Oil Pulling” an effective treatment for arthritis or other chronic diseases? Can a Diabetic Alert Dog detect changes in blood sugar 15 minutes earlier than a glucose meter? Do UV air purifiers reduce the risk of being infected by the common cold or the flu?